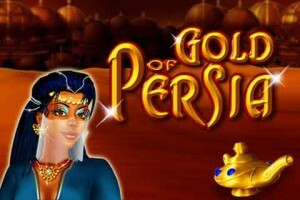 Merkur Gaming develops many different online slots in the Vegas slots style, and Gold of Persia is an addition to that library that celebrates Middle Eastern folk tales. The theme of this game resembles The Arabian Nights most of all, but there are other influences here as well. The game is done in the 2D style without many animations and flashy effects and is designed to play fast, which it does well. 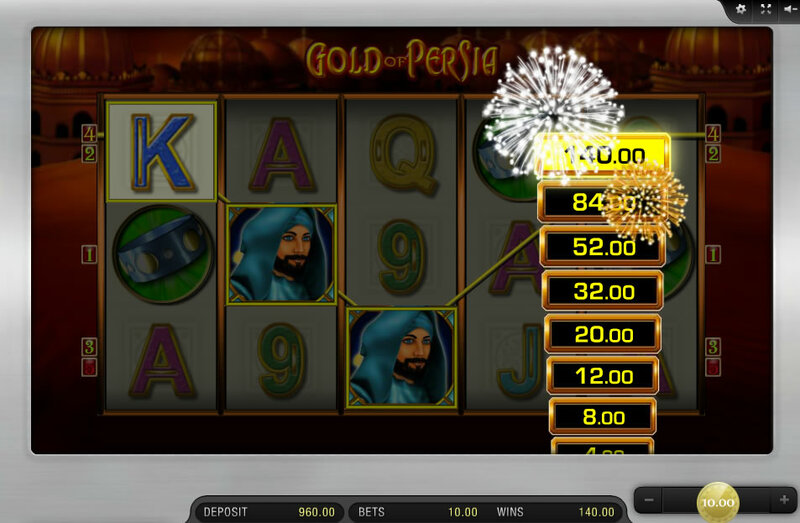 This machine pays out the highest win per spin, which is 10,000 coins at the max bet. However, wins during free games are tripled, so you can actually win as many as 30,000 coins, which is quite attractive on a game like this. Even if you play for just a quarter, you can walk away with almost $200 on any given spin. As with all Merkur games, this also has a free mode that you can use to sample the machine or just to play for fun. Gold of Persia seems to borrow elements from different themes. The main inspiration is clearly the story of Aladdin, but there’s shout outs to Prince of Persia and other properties as well. Although the game never uses the names explicitly, one can assume the main characters are Aladdin and Jasmine. There’s no sign of Abu, but his pet monkey was specific to the Disney interpretation. The symbol set adds to the theme and includes diamonds, Aladdin’s lamp, a jewel-encrusted bracelet, Mojari-style shoes, such as Aladdin wore, and a gong. Even the standard A, K, Q, J and 10 symbols are adorned with jewels and other fineries to fit the theme. There is, however, no flying carpet or genie from the lamp, which both seem to be odd omissions for this particular motif. 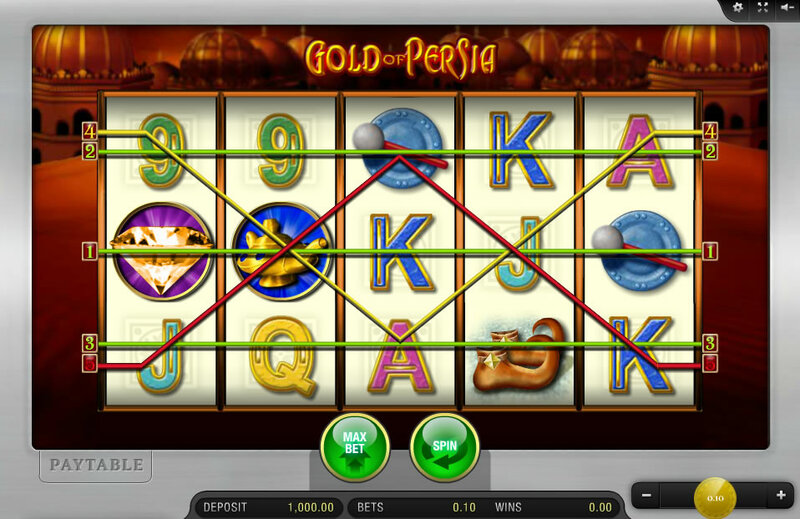 Gold of Persia has five columns, three rows and five pay lines, two of which extend over every row. The two primary symbols are the male and female protagonist. The male Arab is a jackpot symbol that can pay as much as 10,000 coins and dual serves as a wild symbol that doubles any win it’s a part of. The female Arab is the second most valuable symbol, paying out as much as 5,000 coins, and she dual serves as a scatter symbol that awards 15 free games with three symbols, 20 with four and 25 with five. During free spins, all wins are tripled and the potential for free games remains active. A final feature awards a payout whenever any two or more of the diamond and the lamp are adjacent from left to right. 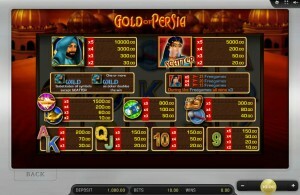 Gold of Persia, which is playable at SlotsClub.com, is a solid slots game that’s simple and plays fast and fair. 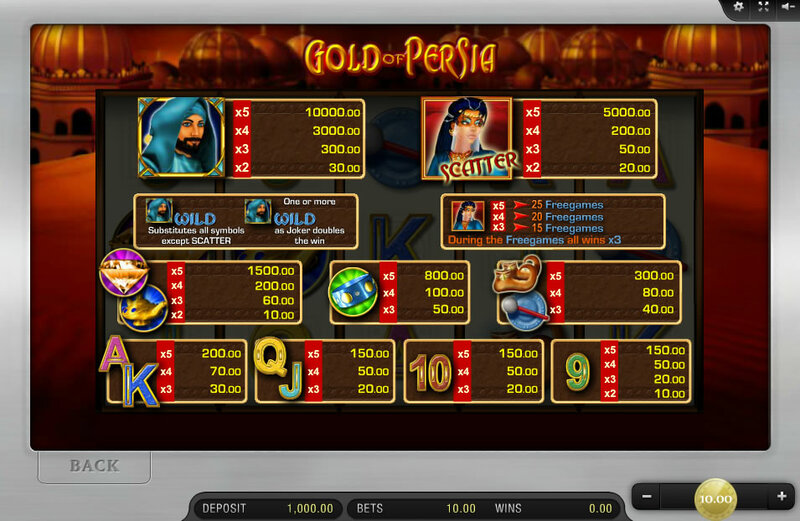 If you’re looking for free online slots, this one is playable as much as you want at no charge. If you’re looking for slots to gamble on, then try it free and work it into your rotation if you like it. A clever feature that’s common to all Merkur slot games is the ability to change coin size and other settings while viewing the pay table. This means that you can see actually what the jackpot is worth to you specifically. The game does have music and sound effects during spins, but perhaps themed music played between spins or while reading the pay table might make the whole experience more immersive. That minor gripe aside, this slot game is a lot of fun and makes interesting use of its theme.